Shopping didn’t used to require a glossary. But now there’s a profusion of labels like “pasture butter” and “field-grown perennial” that require translation. Consider the latter term: what portion of the plant’s life is spent in the field? Is the plant simply a division? Is it qualitatively better than a container-grown plant? To find answers, I asked horticultural experts and went to visit a couple who has been cultivating and selling field-grown perennials for more than 25 years – Julie and Peter Beckford of Rebel Hill Farm in Liberty. Field-grown plants generally do have noteworthy attributes for consumers and some marked benefits for growers, I learned, but the extent depends on the grower’s expertise. “They have to know how to grow in the system they use,” says Cathy Neal, landscape horticultural specialist with University of New Hampshire Cooperative Extension. Field-grown plants are not always better than container-grown ones in terms of plant health or environmental sustainability. But when the plants are grown organically and produced on a small scale, their strengths shine. That difference becomes clear as I watch Peter Beckford dig up New York ironweed plants to sell, each with a root mass at least the size of his fist. He shakes excess soil from the bare roots and then places them in a box before packing them into containers with potting soil for transport to retailers and plant sales. This harvest marks the end of a production process that began more than a year earlier in the Beckford’s unheated greenhouse and is, Julie acknowledges, “extremely labor intensive.” Only a quarter of the plants they sell are divisions from established plants; the rest are started each April, densely seeded into small cardboard trays. Two months later, the Beckfords transfer each of the hundreds of small seedlings into six-pack starter trays and move them outdoors. The seedlings are transplanted by early September into production beds where they get thoroughly watered and mulched with shredded leaves or straw. After that, Julie says, it’s rare for the plants to get watered again. She finds field-grown perennials “amazing” in their capacity to flourish without irrigation, a huge plus for the Beckfords as their property has no electricity and plants are watered by hand, drawing from drums fed by an artesian well. Relative to container-grown production, growers engaged in field-based production typically use less water, less fertilizer and less spray, Wallhead confirms. 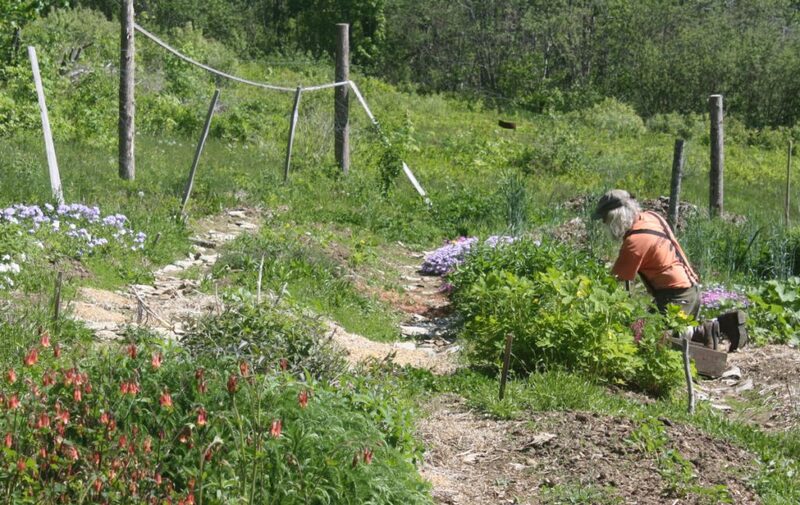 The Beckfords apply no sprays and build soil fertility only with approved soil supplements and local organic cow manure, as their operation is certified by Maine Organic Farmers and Gardeners Association. Their three production beds are modest in size (roughly 1,200 square feet each) so their farm requires only a lawnmower and rototiller – not a tractor. “We like working a system this close to the ground,” Peter says. Part of what drew them to perennial production, besides a passion for plants, is the small scale of operations. “You can do more with perennials than vegetables when you only have a small amount of arable land,” he says. The Beckfords launched their business in the early ’90s when, in Julie’s words, “people were just beginning to realize that you could have a garden without planting each year and with less watering.” Perennial plants were gaining markedly in popularity then, she notes, as native plants are now. “It’s easy to grow perennials organically,” she says, as “the biodiversity is a huge advantage.” Their production beds are packed with dozens of kinds of plants, many of them native varieties that have evolved to ward off local pests. The challenge comes in staying ahead of weeds, which they manage in part by rotating beds and using cover crops to suppress weeds. At Rebel Hill Farm in Liberty, Peter Beckford harvests year-old Vernonia to sell.